Digital transformation has already disrupted the traditional payment ecosystem. Now a new subcategory, paytech, is dominating the Fintech revolution. 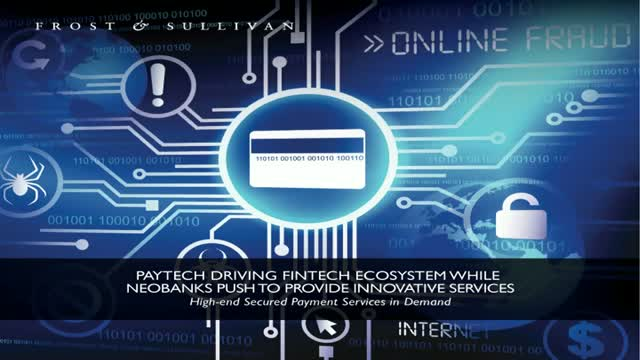 Most innovative services are included in the paytech ecosystem, such as instant, cross-border, mobile, invisible, peer-to-peer or cryptocurrency payments. Furthermore, banks and financial institutions had to digitalize their existing services, creating a new channel with the digital platform. The recent emergence of Neobanks has particularly influenced the historical players by providing innovative approaches leveraging technologies and social media. However, payment services success is based on the perceived confidence future customers will have in the different payment platforms. Trust in the payment service is directly linked to the associated security. Unlike global participants, Brazilian broadband providers offer relatively lower speeds but at higher prices. This trend is now changing. Frost & Sullivan invites you to join Carina Goncalves, Senior Consultant, as she discusses the value of fiber for new video service options in the webinar, Brazil's Fixed Broadband Services Market: Current Stage and Growth Opportunities. It will be followed by an interactive, live question-and-answer session. IoT is at the beginning stages of its growth. Because it offers the ability to capture and leverage data across virtually every aspect of the human experience, its potential is enormous. Organizations that do not yet have IoT on the drawing board must figure out what the IoT looks like, where it fits, and its real-world issues and benefits as they weigh their decisions about deployment. Frost & Sullivan invites you to join Gina Sánchez, Senior Consultant, to gain insights on the current status and future growth potential of the Industrial IoT market in Colombia, the factors that drive and restrict the market, success stories, and projected growth rates until 2022. · What are the key verticals in this market? · How will the revenue shares of the hardware, software, services, and connectivity segments change? · What are the top three drivers for IoT investments? Today, industrial markets are reactive in approaches and digital transformation will help organizations become predictive and preventative. Organizations run the risk of becoming negative latency enterprises, which means customers will predict issues that will happen and prevent them from happening in the first place. Digital transformation and new disruptive technologies make it necessary for mobile operators to innovate their products, services and customer channels. A key growth strategy for mobile operators is to form strategic partnerships to maintain a competitive edge, particularly to enter the enterprise and vertical industry. Mobile operators within the region have already invested in Fourth Industrial Revolution (Industry 4.0) technologies such as cloud, IoT, artificial intelligence, and virtual and augmented reality, and are preparing their network for the opportunities that will open up for 5G. In a time when major data breaches have become a routine feature of the news cycle, digital consumer trust is an intangible and highly consequential metric for any organization conducting business online. With a focus on 10 major global markets, this session will show the results of groundbreaking research that quantifies this difficult-to-measure concept and outlines the business implications of building or losing trust. • Do perceptions of customers in the business community align with consumer reality? • What makes (or breaks) consumer digital confidence in organizations? • Find out the regional variations in the degree of trust consumers have in online services—and the impacts on consumer behavior. Is your workforce built for disruption and a rapidly ever-changing future of work? Policies, demographics, technologies, economics, environmental sustainability, and social movements are shifting how people work and how employers are managing their workers. As many jobs face the prospect of automation, workers and employers need to collaborate to create a modern workplace that supports the growing knowledge economy. • Learn which office technologies are supplanting the massive installed base of legacy equipment in the workplace. • Discover the devices and applications that will support the workplace of the future. • Understand the role that collaboration and wearable technologies play in making workers happier and more satisfied. With the advent of 5G, many technological capabilities that previously were not possible due to low network speeds and high latency can now be realized. This has spawned many use cases across multiple verticals, where industry players are developing new solutions to increase efficiency or offer new services. Operators should ensure that they are not relegated to solely being a connectivity solutions provider to their clients, as this will result in a lack of new revenue streams. 5G is a game-changer as it allows operators to provide value-added services that will generate further monetization opportunities. • Learn about new growth opportunities that operators can tap into to move into key segments of the supply chain. Sustainable Safety Instrumented Systems (SSIS) are a natural evolution of conventional SIS, which allow the key decision makers to optimize their plant’s safety performance without compromising productivity, revenue, and cost. Sustainable SIS incorporates a holistic assessment of operational safety to mitigate and manage risks throughout the lifetime of a plant. It equips all stakeholders to protect businesses from excessive hazard-related downtime. Future growth opportunities will ensure that safety systems in the plant do not become obsolete and help operations run smoothly. Frost & Sullivan's Industrial Practice expert, Muthuraman Ramasamy, invites you to join us for the webinar: Driving Growth of Sustainable Safety Instrumented Systems and Future Proofing Operational Safety. Hear about future growth opportunities, followed by a live question-and-answer session. We can expect to see higher shifts from the on-premise market to the cloud contact center market in the next 12-18 months. While it is still early days, the vendors in this space are already closing deals for real cloud deals, and these are across healthcare, education, retail, government and financial services. The market has seen an entry of new players in 2018 and these players were traditionally not from the contact center segment. Competition is expected to heighten from 2019 onwards. These new breed of players are offering end to end contact center capabilities coupled with analytics and artificial intelligence capabilities. Digital transformation has disrupted the payments ecosystem. Recent technology innovations around contactless payment have transformed the payment industry by providing concrete advantages and benefits to both merchants and consumers. Applying contactless functionality to traditional payment cards can enable a better customer experience based on convenience and ease of use. Furthermore, by promoting contactless payment, merchants can improve their operational efficiency through faster digital transactions that reduce payment times. The infrastructure deployed to process contactless payments must be certified and aligned with the latest security standards to ensure success. The challenges of scalability and time to market compel every content company to have a robust and agile strategy in place before launching an over-the-top (OTT) service for a critical mass of viewers. The service provider has to invest not only in content but also in technology and infrastructure, which enhances the quality of experience (QoE) for the end user. This webinar will provide an overview of viewership trends for digital versus traditional television, OTT video business, common challenges for OTT video services, and the modern-day approaches in the video delivery workflow. In today’s digital marketplace, consumers and businesses increasingly expect to be able to make instant payments, wherever they are, and at any time of day. The adoption of real-time payments capabilities is very much an essential for banks who wish to retain market share and capture new customers. 5G is on its way. It may be closer to 2019-2020 for some but for others, it may be 2023-2025 before it materializes. In all the countries that are frontrunners of 5G in Asia-Pacific, 5G is benefiting from local government support coupled with local demand or at least the potential for demand for 5G services. The demand may be incentive or market driven. The market for 5G is expected to have reached $4.50 billion by 2022 with 280.4 million 5G subscriptions. The implementation timeline for MNOs will vary from country to country, albeit not as widely as it was with 3G or 4G. Frost and Sullivan expects that government support for 5G in populous countries such as China and India and new business models that will emerge out of the trials by MNOs at the upcoming Olympics will support high service revenue growth at CAGR of 315.1% from 2019 to 2022. 5G will trigger a quicker transition to distributed, cloud native networks that leverage on NFV, SDN, and MEC to reduce cost to serve and improve on efficiency and profitability for MNOs. Further, with 5G offering latency below 1ms and larger bandwidths, mobile networks can gain an edge over fibre networks and regain competitiveness. •How will 5G impact industry? •What are the market challenges and opportunities? •What are the key drivers for growth? •How big will the market be for 5G by 2022? The need to embrace digital transformation in all possible scenarios is paramount to bring efficiencies and improve current business processes. The challenges of real-time data processing, high network speeds and latency can be overcome by using ICT technologies, i.e., Mobile Edge Computing/Fog Computing. These computing technologies bring compute and storage capabilities to the edge of the network and enable real-time and context-based business applications. All industry verticals can find relevant application areas that can benefit from computing at the edge of the network. Prior to the era of digital transformation, international expansion was largely the domain of very large organisations that were capable of investing in infrastructure across the world. Today, the vast majority of IT solutions that enable innovation are deployed in the cloud; such solutions are opening up new opportunities for businesses of all sizes. When it comes to international expansion, acting local but delivering consistent and flexible services is essential. Cloud-based solutions allow organisations to internationalise quickly and enable start-ups to be “born global”. Digital transformation is already impacting financial services, and future banking will evolve to leverage technology in ways that will have a much deeper implication to customer service than current use cases. As a result, numerous interactions between customers and digital banking will be done by using mobile devices and cloud-based platforms. Furthermore, security will be key to creating confidence in the value chain. Financial service providers are investing in bringing services to customers on personal devices, increasing the need for software/hardware security solutions for authentication of transactions. Biometrics can be leveraged for strong authentication and to comply with regional regulations. For more than a decade, industry experts have predicted the death of smart cards. However, the embedded SIM (eSIM) has an impact on the telecommunication vertical, and many other verticals continue to benefit from the tremendous advantages of this secured device. Frost & Sullivan forecasts that, in 2017, the market will continue to grow at a 4.7% CAGR globally for all verticals, including telecommunication, banking and payment, government and ID, transportation, and physical and logical access. In a growing market, innovation is key. This is why major players have added innovative functionalities to the existing medium to strengthen security and provide a more exciting user experience. From the beginning of the energy sector's digital transformation, many technologies have emerged to offer new opportunities and challenges to industry participants. As technology development cycles accelerate, it is easy to dismiss new possibilities as irrelevant or impossible to implement, but blockchain and distributed ledger technology may prove vital to industry transformation. In this briefing we discuss the development, opportunities, pitfalls and future predictions for the technology. Digital transformation is impacting the automotive industry thanks to the rise of embedded software, autonomous behavior and hyper connectivity. But connected cars are often mentioned when referring to hacking or security threats and risks. At Frost & Sullivan, we strongly think that connected cars will drastically change the way people interact with vehicles due to the numerous communication technologies and associated services that will be available. Even if security is mandatory to create confidence in connected car usage, real value-added services are also vital for a successful commercial rollout. The My-Car-as-a-Service concept will transform existing car usage in a frictionless experience. Frost & Sullivan's Digital Transformation webcasts provides global industry analysis, market forecasts, competitive analysis, and insights into emerging technologies that are designed to help your company address current trends and challenges. Our global teams of industry experts, consultants, and market analysts continuously monitor big data, cloud computing, communication services, conferencing & collaboration, digital identification, digital media, mobile & wireless, space & communications, IT applications & services, network security, customer contact, and unified communications markets.